Sen. Ben Sasse (R-Neb.) blasted the Trump administration on Saturday for having "18th-century views of trade" after it was reported that President Trump was preparing to withdraw the U.S. from its free trade agreement with South Korea. 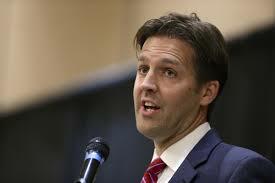 "The president and Nebraska have a basic disagreement about trade," Sasse said in a statement. "His Administration holds 18th-century views of trade as a zero-sum game. I side with our farmers and ranchers who are feeding the world now," the conservative senator added. Of course, Sasse is correct on this. Ok Sasse, introduce legislation to remove crop insurance subsidies and agricultural price floors. The ag industry is heavily propped up by government. Nebraska farmers receive nearly $2 billion in subsidies annually. Charlatan.